Instructors: Mohamed & Haitham Elseht Twins Cartoon. Twins Cartoon is the pseudonym of Egyptian artists Mohamed & Haitham Elseht who happen to work in the same field. Graduated at the faculty of fine arts, animation department 2008. -Founders of Kawkab El Rasameen (Painters planet) Project. -Jury members and Comics Experts at BECA “Egypt International Comics Week”. -Founders of Garage Comics Magazine. 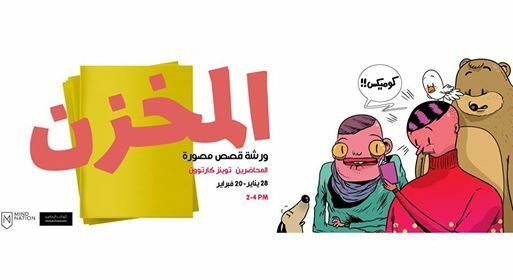 -Co-founders of Cairo Comix international festival. -Represented Egyptian Comics as speakers at Design Indaba Festival at Cape Town-South Africa. -Honored at the Mahmoud Kahil Awards at AUB”American University of Beirut” as Cairo Comix Festival , which the patron of Comics in the Arab region March 2017. -Took apart in “Lampedusa-Image research group” book project about illegal migration, September 2015-October 2017 The book have been launched and displayed at Frankfurt book fair 2017. 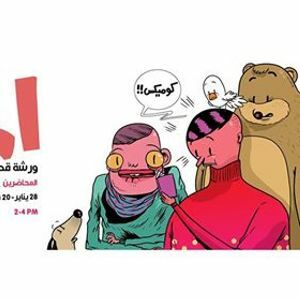 -Chosen as one of 48 Arab Comic Artists to show at exhibition on Contemporary Arab Comics at La Cite Internationale de la bande dessinee de l’image Festival(Angouleme,France) in partnership with American University of Beirut through Mu’taz and Rada Sawwaf Arabic Comics Initiative (Beirut,Lebanon) January 2018. This workshop will allow the participants to share their experiences together. It will also help raise the technical (especially about the narrative techniques) and conceptual level of the participants who are taking part in this workshop. In addition to holding a workshop that will enrich the minds of the participants, this workshop will result in comics anthology that is reflective of the participating – a collective printed affordable zine. An entire section of this workshop will be produced by participants, who have a fair background in drawing skills. After the submission participants will be invited for the workshop. The aspiring participants will be picked according to their drawing skills. The deadline for filling the application is 26 Jan 2019. .
-History of Arab & international comics. -Idea, Script writing, Narration, Acting, and Storytelling. -Storyboard, Character design, Color theory, and background (Concept Art). -Direction (Camera angels, Shots size, layout, Balloons, and fonts). -Software, Graphic Design & Graphic layout. 02:45 PM over coffee at Mind Nation co-work space. 02:00 PM Participants meet-up, and Twins Cartoon. 02:00- 04:00 PM Each participant will talk about his/her art vision or passion, and reflect on his/her vision. Participants will also be given the chance to talk about the workshop topic and discuss it. In order to book your place; please pay a deposit through visiting us at our premises or through Vodafone cash on 01091731332 as there are limited places. 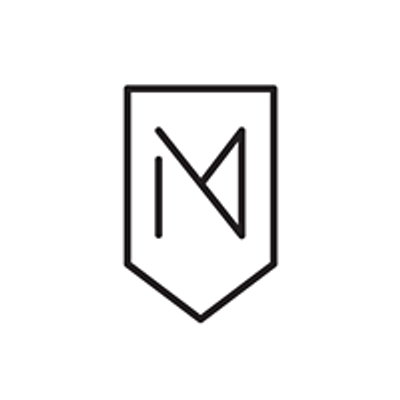 MindNation's Address: villa 114,unit 2B, el narges 4, New Cairo. For more information. call us at 01091731332.